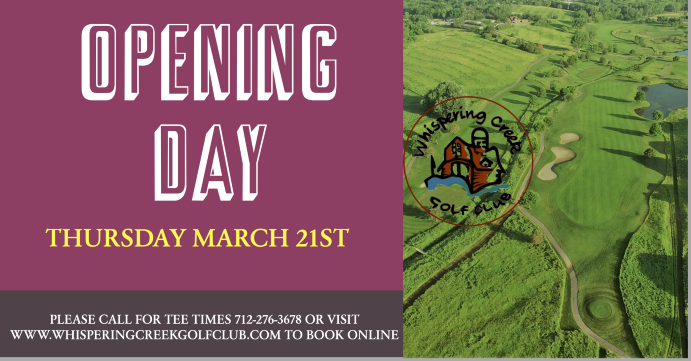 We are excited to announce that Whispering Creek Golf Club will open up on Thursday March 21st!! We will be cart path only for a little while but Matt and his staff are working hard to get the greens and course ready for play. The range will remain closed until it dries up a bit, but we will let you know as soon as it is playable. The rate for 18 holes w/ cart will be $45 for the rest of March and the 9 hole rate will be $25. Course will open at 10am for this week and will asses the weather and frost conditions going forward. We will give an update if we decide to open earlier for the month of March. Don't forget to come purchase your Memberships for the 2019 Season. We also offer a great Business Membership package as well. See below for details. You’re receiving this because you opted in on our website.